Dubai, United Arab Emirates – October 01, 2018: Dubai Cares, part of Mohammed bin Rashid Al Maktoum Global Initiatives, has renewed its commitment towards global education efforts by announcing new strategic partnerships on the sidelines of the 73rd UN General Assembly in New York. Among these key announcements was Dubai Cares’ endorsement of the UNICEF Generation Unlimited initiative - a new global partnership dedicated to increasing opportunities for and investments in young people. Dubai Cares’ commitment aims to support ‘Promising Ideas’ that have transformational power in long-term value creation and achieving the goals of young people, with a particular focus on those in the greatest danger of being left behind, including girls, the poorest, those with disabilities, young people on the move and those affected by conflict and natural disasters. The launch of Generation Unlimited initiative at the United Nations Headquarters in New York brought together government ministers, development agencies, the private sector, academia, international and civil society organizations, and young people themselves, in order to identify, co-create, resource and scale-up innovative solutions to expand on opportunities for young people. 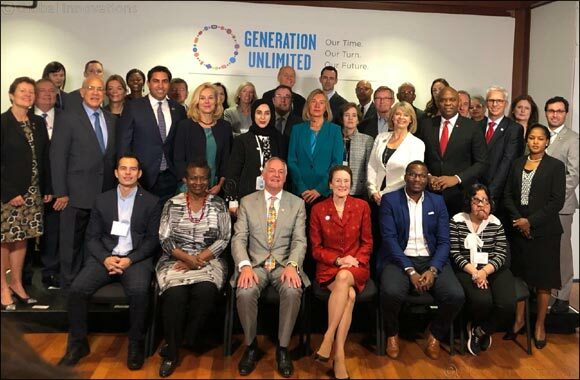 Following the launch of the initiative, Dubai Cares also participated in the inaugural meeting of the Global Board of Generation Unlimited, which brought together representatives from private and public sectors, as well as youth representatives from around the world. Dubai Cares also renewed its support towards Education Cannot Wait, a global fund for education in emergencies. In line with its education in emergencies strategy, Dubai Cares’ support will ensure that the education of children and young people displaced by conflicts, epidemics and natural disasters is not disrupted. As a member of the High-Level Steering Group for Education Cannot Wait, Dubai Cares contributes to leveraging additional finance and catalyzing new approaches to funding and innovation to deliver education in emergencies and protracted crises. “The extraordinary efforts made by Education Cannot Wait have drawn tremendous attention to the overwhelming need for a collective global push to provide sustainable and innovative educational solutions for children affected by emergencies and protracted crises. Through this renewed support to Education Cannot Wait, Dubai Cares remains committed towards transforming the delivery of education in emergencies with the hope of reaching all crisis-affected children and youth with safe, free and quality education,” said Al Gurg. Dubai Cares also announced its commitment to scaling up Room to Read’s program in Vietnam over three years, after it was identified as a Goalkeepers Accelerator toward the U.N. Sustainable Development Goals (Global Goals) at the Bill & Melinda Gates Foundation’s second annual Goalkeepers event in New York City. Room to Read’s Goalkeepers Accelerator demonstrates effective system-level change for early-grade literacy. The program scale-up takes Room to Read’s proven literacy model, including results in reading levels of children by grade 2 and associated library interventions, and implements the model based on the components of the program that align best with local governments’ priorities. The Dubai Cares supported scale-up in Vietnam also allows Room to Read to establish “model libraries” that will be replicated by the government, in partnership with the Ministry of Education and Training (MoET). Commenting on the involvement with the Global Goalkeepers and the extended support to long-term partner Room to Read, Al Gurg stressed the longevity of the relationship with both organizations. “We are always keen on expanding our collaboration with our partners by scaling proven interventions in education,” added Al Gurg. Dubai Cares also participated in high-level international platforms such as the World Economic Forum’s Sustainable Development Impact (SDI) Summit to drive solutions for the 2030 Agenda for Sustainable Development and Paris Agreement on climate change. During the summit, Al Gurg joined a panel of experts including Alice Albright, Chief Executive Officer of the Global Partnership for Education and Vikas Pota, Chairman of the Varkey Foundation, to discuss strengthening education systems. The SDI Summit was attended by more than 750 participants which included entrepreneurs and leaders from various sectors. Al Gurg was also a member of the jury in the MIT Solve, a premier social impact live pitch event by Massachusetts Institute of Technology that witnessed the participation of diverse groups of innovators who presented their ideas on how to address global challenges including ‘Teachers & Educators’. Dubai Cares’ participation in events and meetings on the sidelines of the United Nations General Assembly reflects the organization’s long-term advocacy efforts to safeguard children and young people's right to education. The organization’s continuous involvement in this strategic gathering, allows it to participate in and influence the international development agenda and dialogue.